VTV.vn - In celebration of the 65th anniversary of Dien Bien Phu victory, the Arts and Culture Department - VTV produced a series of short films the Road to Dien Bien. The Road to Dien Bien takes the viewers back to the histoical places attached to the Dien Bien Phu victory, from Co Noi crossroads, Pha Din pass, the commanding post of Dien Bien Phu campaign in Muong Phang to the hills where the fierce battles were fought such as hill A1, Green hill, C1 hill and E hill. 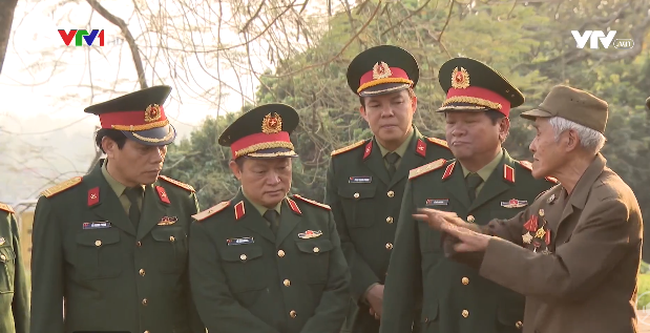 In producing this short film series, the team of the Arts and Culture Department had a long working trip in Dien Bien city, returning to the old battlefield with the witnesses. Many vivid stories told by those who saw and participated in the campaign excited the film crew. "All rivers flow", "Rubber sandals and Hoang Cam kitchen", "From Na Tau to Muong Phang", "Road to the Northwest", "Under the fire" and "Season of blooming flowers” are the titles of episodes of the series which revived the atmosphere of fighting, the spirit of “everything for the front lines” of the Vietnamese army and people in the days of Dien Bien Phu campaign.